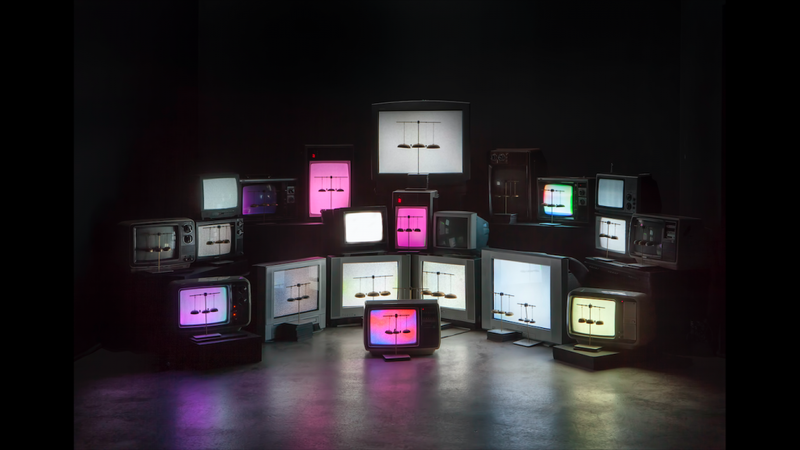 The Electrostatic Bell Choir is an electromechanical sound installation that plays with the static electricity emitted from discarded CRT television monitors. This static (that can be felt when one places their hand on the screen when the TV is turned on) is gleaned for its potential to generate subtle movement and is used as the driving kinetic force in the artwork. Sets of static bells* consisting of ultra lightweight pith balls and bells from old grandfather clocks and rotary telephones are mounted in front of an assembly of twenty reclaimed Cathode Ray Tube television sets. A control circuit cycles the TVs on and off in alternating sequences which causes static to build up on the monitors. This static charge agitates the hanging pith balls, causing them to waver and lightly strike the bells ? resulting in quasi?melodic compositions. The TVs are muted, tuned to various channels of white noise and physically spacialized in order to devise a dynamically layered soundscape textured with the signature high-frequency hums, pops and buzzes of the cathode ray tubes warming up. Although compositions are programmed into the piece, it inevitably takes on a character of its own as the static fluctuates and dissipates in response to ethereal nuances (i.e. : changes in air quality such as humidity). The glow of the screens and the subtle resonance of the bells magically punctuate the dark surroundings of the installation. *Electrostatic bells were invented in 1742 by Andrew Gordon, Professor of Natural Philosophy at the University at Erfurt, Germany. This is the first device known to convert electrical energy into mechanical energy (the moving of a bell clapper back and forth between two oppositely charged bells). It was popularly used at the time to predict oncoming thunderstorms by sensing static electricity in the air. The Electrostatic Bell Choir aims to focus the sensibility of this invention to a more personal scale where it demonstrates the intriguing effects of the invisible environment that constitute our domestic spaces. The artwork is at once mysterious yet can be tangibly deconstructed as the relationship between the static charges and the bells is observed as the TVs illuminate and catalyse the effect. Production of this work was made possible with the generous support of Edith-Russ-Haus für Medienkunst in Oldenburg Germany, Le Conseil des arts et des lettres du Québec and Hexagram Concordia.